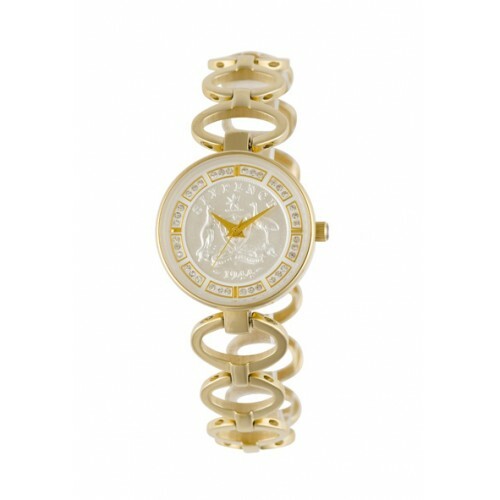 Product Code: CASI 56313W "made with Swarovski Crystals"
This chic stainless steel case has a circular link bracelet with snap jewellery clasp and ionic gold plated finish. A white upper dial is embellished with crystals and spaced as hour markers to compliment the coin centre. A scratch resistant sapphire crystal ensures you will always look your best. A precision Swiss quartz analogue movement will provide years of reliable time keeping. A genuine sixpence coin is featured as the dial face and available in your selection of years from 1910* through to 1963. The coat of arms design shows a shield representing each state with a kangaroo and emu chosen because neither animal can walk backwards supporting the slogan ‘Advance Australia’. The sixpence was not minted in 1913, 1915, 1929, 1930, 1931, 1932, 1933, 1947 and 1949. A Commemorative dial will be featured in these years and from 1964 to the present. • Genuine sixpence coin or commemorative dial• Swiss movement with sweep second hand• Stainless steel case and bracelet• Scratch resistant sapphire crystal• 30 metres water resistant• 3 year international warranty against manufacturing defects *Extra charges apply to coins before 1930 The high standard of each Coinwatch timepiece is maintained with the elegant box design. The sheer luxury of the box ensures a sense of pride when presenting the timepiece as a gift and provides safe storage for your watch when not in use.